The roast pork tenderloin served for dinner at the Rifflin'Hitch Lodge in Southern Labrador, Canada looks delicious in this picture, imagine what it tastes like straight out of the oven. 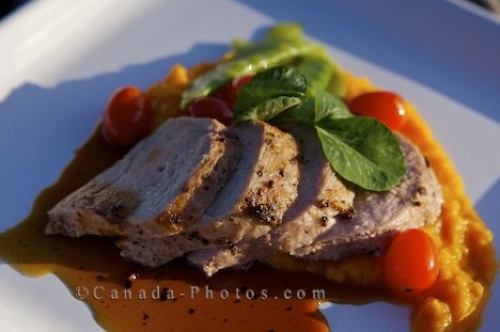 Cherry tomatoes decorate the pork tenderloin dinner which is laid out on specially made vegetables, topped off with some greenery. Picture of roast pork tenderloin dinner, topped with a sauce and adorned with vegetables at the Rifflin'Hitch Lodge in Labrador.